What are the grievances that lead to suicide bombers in Ohio? Michiganders fight for stolen land and right of return to the Buckeye State. The Ohio State motto, implying a divine right to invade Michigan, has stirred resentment among the northern farm peoples. Over the past few weeks, violence in the centuries-long Ohio-Michigan conflict has flared up, with almost weekly suicide-bomb attacks in the Buckeye state. Here’s what you need to know. Bloody rivalries are not unusual in this part of the Midwest, but this particular wave of aggression is very different from the orchestrated gridiron battles of the past. The Michigan-Ohio conflict has its roots in the nineteenth century with the movement towards territories becoming states. The collision between those two territories eventually escalated into the Toledo War in 1835, and expanded into the wider Wolverine-Buckeye conflict later on. Following the Declaration of the Establishment of the State of Michigan on January 26, 1837, which forced Michigan to cede the coveted Toledo Strip to Ohio, the Michigan Wolverines decided to intervene on behalf of Ohioan Michiganders, marching their forces into Ohio State University in 1897 and then on a yearly basis since 1918. Michigan has defeated the Ohio State Buckeyes 58 times in their 112 conflicts, most notably in 1902 when Michigan crushed Ohio 86 to zero. According to some historians, Ohio was not legitimately a state when the Toledo Strip was forcibly removed from Michigan. These historians claim that Ohio was only retroactively made a state in 1953. Michigan was offered frozen deserts to the north in exchange for the fertile Toledo Strip. The so-called “upper peninsula” is unattached to Michigan, requiring a massive bridge be built to allow Michigan to access the frozen wasteland. In an unwritten arrangement in place since Ohio took control of the Toledo Strip in 1836, Ohioans are not allowed to use the Highland Meadows Golf Club. Increasingly in recent years, hardline Buckeye activists have demanded greater access to the golf course and Chamber of Commerce spokespersons have called for rights of Ohioans to play there. This has sparked widespread concerns among Michiganders that the status quo is being violated, and will end in the division of Highland Meadows. Hardline Buckeyes justify Ohio’s interstate war crimes by claiming that under some interpretations of the the Michigan state motto, if you seek a pleasant peninsula, conquer Ohio, Michigan does not acknowledge Ohio’s right to exist. Most experts aver that the motto merely seeks a right to return to the Toledo Strip, however, noting that the Latin form, Si Quæris Peninsulam Amœnam Vincere Ohio was never meant to be taken literally, but rather as a figurative yearning for home. Critics of Ohio’s violent rhetoric point out that the Ohio motto, with God all things are possible reflects a right-wing desire to oppress in the name of religion. They note that an earlier Latin version of the motto, Imperium in Imperio, contains allusions to imperialism and conquest. 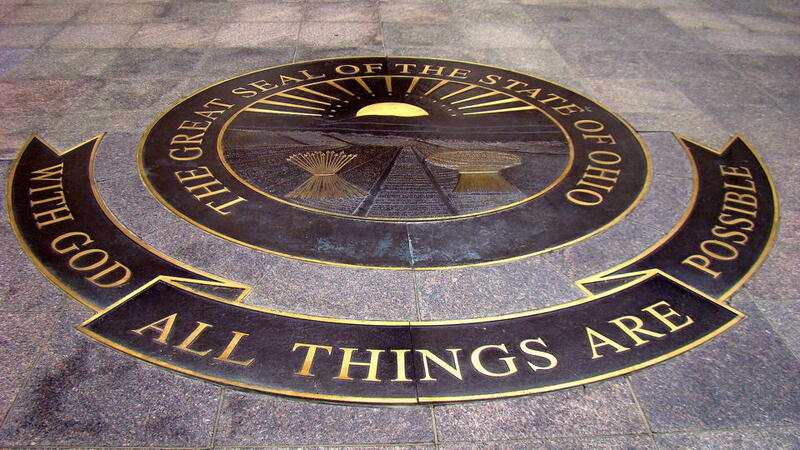 The United States Court of Appeals has ruled that the Ohio motto is illegal under federal law and should not be used in any public manner. Ohio, however, continues to use the motto on buildings, documents, and the official state seal, including in all dealings with Michigan. To help preserve peace in the region, President Obama has entered negotiations with Michigan Governor Rick Snyder to provide Michigan with a ten-year pathway to nuclear weapons. Due to health issues, Bay Leaf Books in Newaygo will close in early 2017. It’s so dangerous to be outside that the Michigan Department of Environmental Quality wants everyone to spend more time outside. Unless you are an active adult. Or a sick one. This is a great introduction to the strange factions of the Arab world, the Shiites, the Sunnis, the Orthodox Christians of Lebanon, Saddam Hussein vs. the princes of Kuwait. Who wants the United States to lead? After Paris, can we still wonder whether it’s a better idea for the United States to leave world peace to bickering tyrants? Ohio resists Michigan suicide bombers, rekindles Toledo War last modified January 30th, 2016. Copyright © 2019 Leni Films.